E-cigarettes: Gateway to nowhere slope is not so slippery, after all. Since its inception in 1978, the American Council on Science and Health has been a leader on smoking cessation, led by our late co-founder Dr. Elizabeth Whelan. To achieve a world without cigarettes, we've supported any means necessary to free a smoker from this insidious habit: patches, pharmaceuticals, gums, e-cigarettes and, heck, hypnosis if it'll do the trick. As long as something is helping smokers kick the habit, it's good for public health. However, there's concern that the reverse might be happening--and people are starting to smoke after using one of these products. The product most often questioned are e-cigs. Studies have shown that they are safer than tobacco cigarettes, and some data also show they may help people quit cigarettes. Smoking is dangerous and no harm reduction technique except a full stop is perfect, but since they are far safer than combustible cigarettes, that's good enough reason to include them in the harm reduction tool chest. 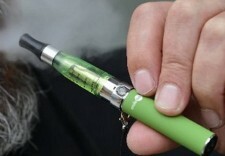 But a new study published in JAMA suggests that e-cigarettes might be a gateway to combustible cigarettes for teenagers. Among the data: a survey of 2,500 9th graders who reported never having tried cigarettes; and then a follow-up with them six and 12 months later. At the start, nine percent of the students had tried e-cigarettes, and at six and 12 month intervals these students were more than twice as likely to have tried a tobacco cigarette than those who had not tried e-cigarettes at baseline. Some are interpreting this as evidence that kids try e-cigarettes, get hooked on nicotine, and move on to tobacco cigarettes. But the paper has some red flags. First, it is a survey. Of teenagers, no less. Surveys in general are not going to be scientific and teens are even more likely to skew results. But that part might actually be worth overlooking, since it was nationally representative cross-sectional data. However, the next one can't be so easily overcome: It is difficult to know if, or how many, students who tried e-cigarettes at baseline weren't going to try tobacco regardless of their initial exposure to e-cigarettes. Only 54 study participants who had never tried tobacco regularly used an e-cigarette and that's in the statistical noise range. The age group in the study had just moved to secondary school, and that is a time when they experiment with alcohol, prescription drugs, marijuana and engage in many risky behaviors. So simply because this survey found that the order was electronic to combustible for this group, it does not mean the transition was causal. They may be irrelevant. Finally, if we want to accept cross-sectional surveys--basically, a snapshot--of teenagers as valid for implying causation, then the strongest link would be to cigars, not cigarettes. The idea that "e-cigarettes are a gateway to cigars" is so hilarious that mainstream media won't cover it, yet reading the survey results and looking for the biggest hazard risk would conclude that. This really devalues the study because these two activities are very different: e-cigarettes are inhaled and cigars are not. Furthermore, the definition of the cigar is so broad it includes certain types of marijuana use, which muddles this observation even further. The question of whether these (or any other nicotine product for that matter) are a gateway to combustible cigarettes is an important question. But this study falls short in answering it.